As measles sweeps across Democratic Republic of Congo (DRC), more than one million children have been vaccinated against the disease in a nine-month campaign by Médecins Sans Frontières (MSF – known as Doctors Without Borders), supporting the Ministry of Health. For those who suffer complications and who fail to receive treatment, it can prove deadly. For the vaccine to be effective, 95% of children aged from six months to 15 years need to be vaccinated. In a country as large as DRC, where roads are often poor or non-existent, and travelling can be hampered by insecurity, considerable logistical constraints exist to reach children in certain areas. MSF teams have travelled by motorbike and on foot down narrow forest trails to reach the most remote areas. Despite the difficulties, MSF teams are determined to reach the remotest areas, as children there are particularly vulnerable to measles, due to the scarcity of available healthcare and people’s inability to pay for it. 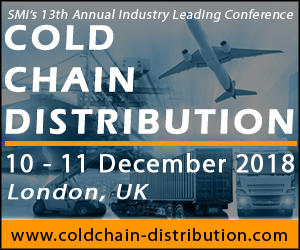 Marco Gaudesi, Pharmacist – GDP and Cold Chain Referent, MSF will be speaking at the 13th annual Cold Chain Distribution conference this December exploring the pharmaceutical logistic challenges they face in the humanitarian aid; the experience of MSF. He will provide insights into the challenges of ensuring an end-to-end temperature-controlled supply chain with limited resources, addressing the security challenges faced by MSF in the temperature-controlled supply chain and future strategies for prevention of temperature excursion in challenging environments.